Release date: December 4th, 2018. This new release of Passbolt Pro Edition introduces a new workspace for administrators. In this workspace it is now possible for an admin to enable and configure multi-factor authentication providers. Once you have upgraded to the latest version you can follow the documentation to configure these providers in the configure section of the help pages. Similarly it is also possible to configure and run the LDAP directory synchronization. This interface allows you to define the configuration options such as the Domain, Server URL, Base DN, etc. For complex schema configuration you would still be required to create a custom configuration file as explained in the LDAP help pages. Another interesting improvement for LDAP directory is the ability to filter out inactive users from the sync as well as specify a group filter. 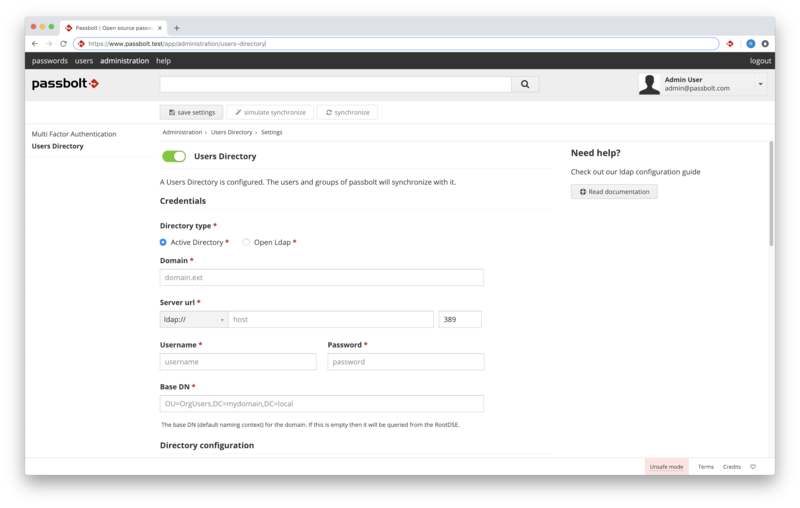 For example you could create a group ‘passbolt’ in your directory and assign only the users or groups that you would like to sync to this group. A big thank you to Christoph Grabmer for this feature proposal. PASSBOLT-3218: As an admin I can configure the multi factor authentication providers for my organization from the admin panel. PASSBOLT-3150: As an admin I can filter out inactive accounts from the directory synchronization. PASSBOLT-3141: As an admin I can filter out users that are not part of a group in ldap from the directory synchronization. As DEV I can test the fields of my form. PASSBOLT-3111: As a user using the CLI I can login using Yubikey or TOTP multi factor authentication. "she is a mean mean machine"